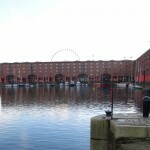 The Albert Docks is the area where the strongest contrasts exist between old and new. 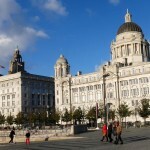 Arriving in Liverpool in the north west of England we were surprised to find so few people out and about in the city. To be fair, we were only in the city on Monday and Tuesday, probably not the busiest days of the week. We asked a local cafe owner where all the people were, and she replied, “Liverpool is ‘slow and sleepy”. Regardless, we still found a city that has some wonderful contrasts between the old and the new. 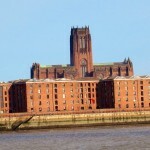 Liverpool was heavily bombed during World War II and this cleared the way for the modernisation of the city. 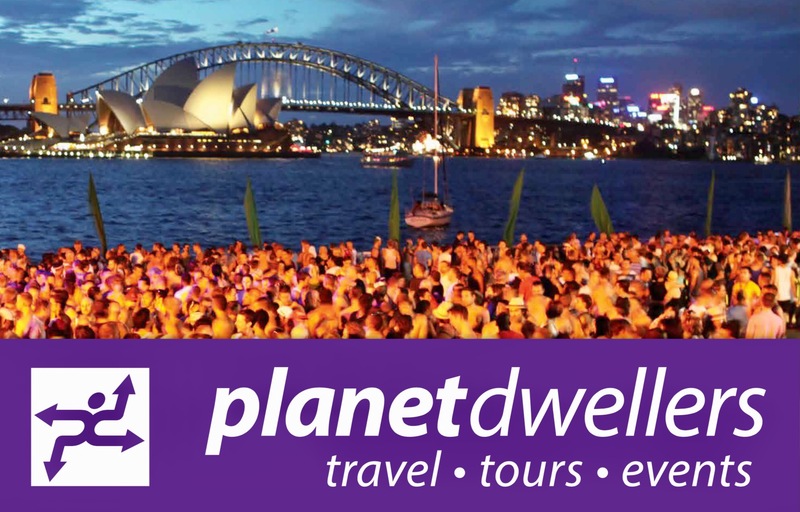 Liverpool still has many prized historical buildings and is best known for its outstanding Victorian architecture, so much so that parts of the city are now World Heritage listed. 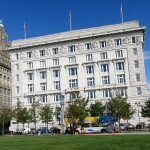 These include the former head office of Cunard Shipping Lines and the Catholic and Anglican Cathedrals. The principal areas to see some of Liverpool’s ultra modern architecture mixed with the gracious and charming older buildings are the waterfront, the area around St George’s Hall and Liverpool ONE, the main shopping precinct. 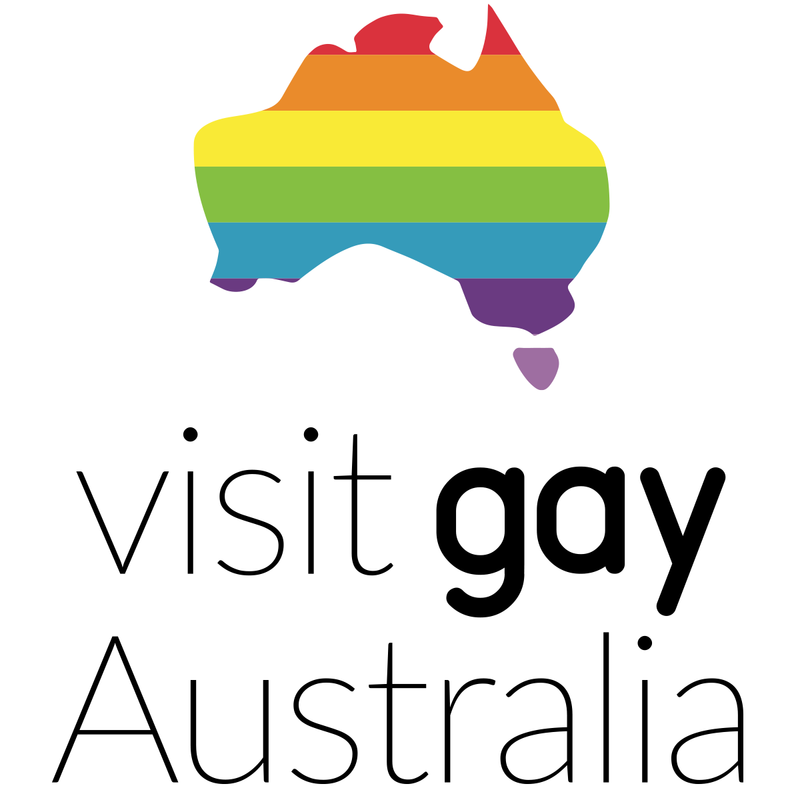 The gay scene in the city is mainly concentrated around the Stanley Street Quarter. On a Monday and a Tuesday we had little success as most bars were closed. 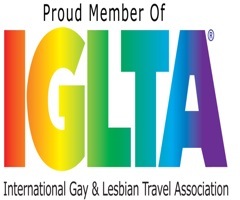 On the weekend, we were told, things get quite busy and some of the most popular bars are The Masquerade, The Lisbon, Navy Bar (the beautiful people‘s bar), Poste Bar and the oldest gay bar in the city, The Curzon. The Lisbon was the only bar we found open and on the nights we were there it had a very mixed crowd. 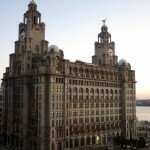 The bar is one of Liverpool’s more established gay venues, set in a grade-listed building. The bar’s ornate pressed metal ceilings, chandeliers and restaurant style seating give this very large bar a unique character and real old world warmth. We ate at Fonseca’s Restaurant at 12 Stanley St. We started our evening with a drink at the wine bar downstairs, known as Deli Fonseca. It has a mini deli counter for take-out lunches and eat-in deli nibbles. Its big brother upstairs is an institution in Liverpool and a ‘must try’. How delicious do these dishes sound from the restaurant’s daily changing blackboard menu? A couple of the starters were baked garlic and parmesan tart, smoked salmon cannelloni, pickled cucumber and lemon yoghurt. Mains were just as tempting with tomato and basil hake gratin with broccoli, wilted spinach and roasted tomato. ‘Land,Sea and Air’ consisted of green lipped muscles, king prawns plus ribeye with baked garlic and ginger and poached duck egg. We ordered the rich goosnargh chicken stew in red wine, chorizo, chill and basmati rice, perfectly cooked and sumptuous. A decision was equally difficult for dessert. The peanut cream brûlée and the Baileys pannacotta were very popular choices. 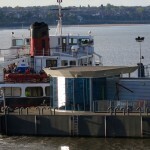 Take the ferry across the Mersey. 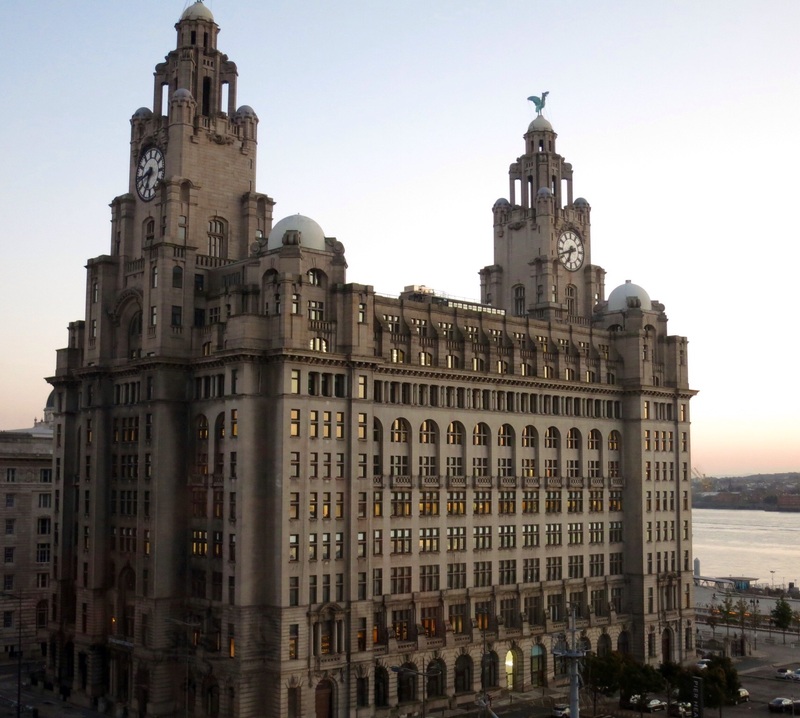 The imperial majesty of the Liver Building on the waterfront. 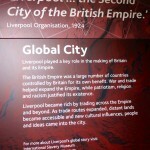 Liverpool, an important British city both historically and today. 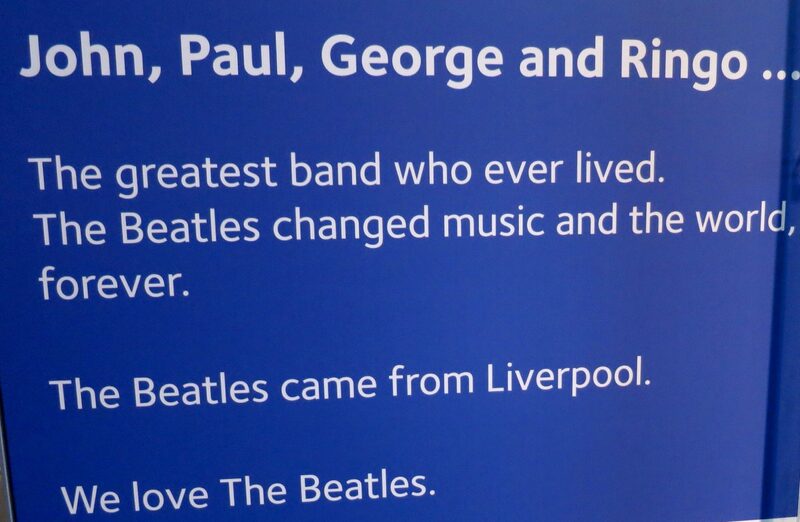 Of course, the famous four were local lads. 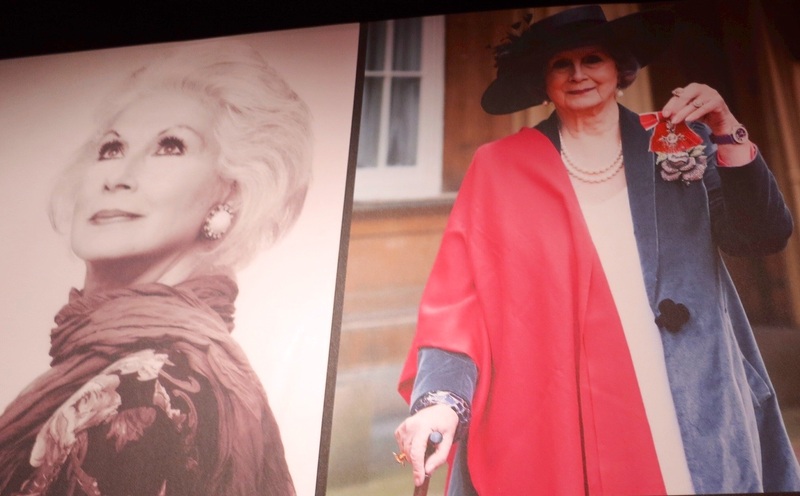 The April Ashley story is a fascinating tale not to be missed in the Liverpool Museum. 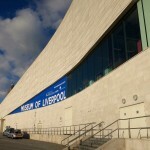 The imposing modern facade of the Liverpool Museum. The next day we had a delightful fish and chip lunch at the Pumphouse looking out over Merseyside. This stunning refurbished waterfront icon now houses a modern pub or inn style eatery which serves up generous portions of the most amazing selection of meals. We had cod fillet, freshly hand-battered and served with seasoned thick-cut chips, mushy peas and tartare sauce. A traditional favourite, served on a printed copy of the catch of the day, a mocked up newsprint article which details Britain’s national obsession with fish and chips. On this cold grey afternoon this meal was ‘just the ticket’. We visited three outstanding Museums over the two days. 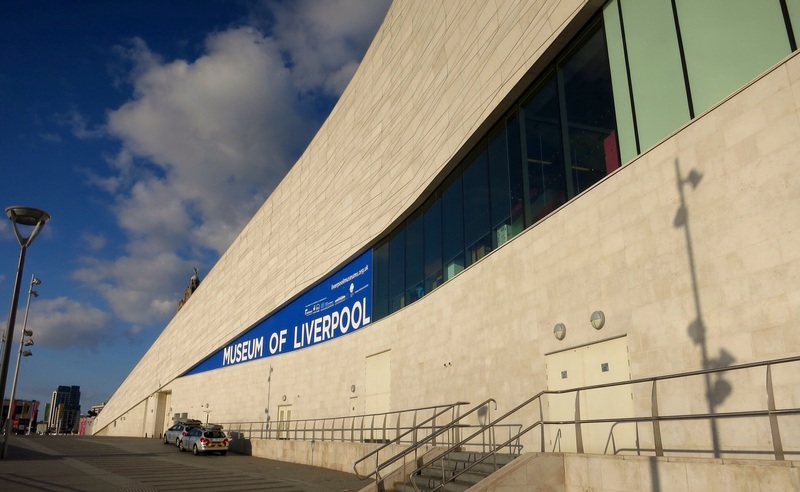 The Merseyside Maritime Museum and the International Slavery Museum are housed in the one building and are both outstanding. In the Maritime Museum there was an excellent exhibition of Gay Life On the Ocean. We found the display of Polaris language very interesting. This secret language, used by gay sailors based on slang and back spelling, was a way gay sailors talked to each other in front of straight men. 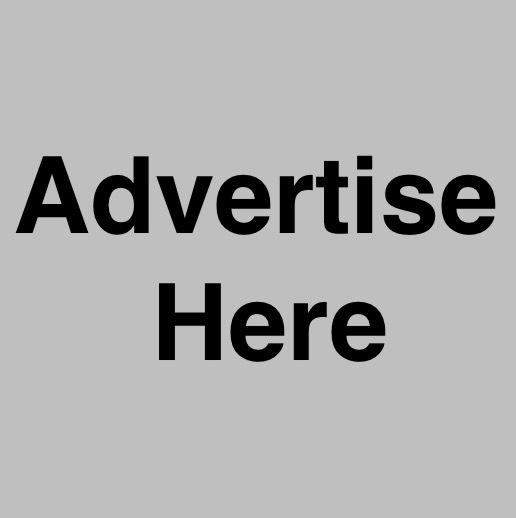 The language fell into decline during the last thirty years but is having a resurgence in Britain with the popularity of the stage show Around the House. 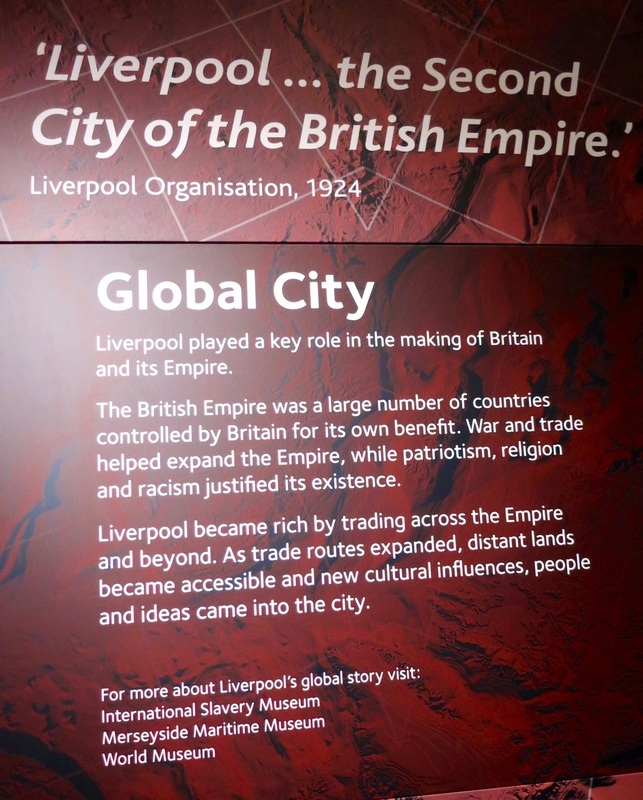 The Slavery Museum is a strong reminder of the important part the port of Liverpool played in the transport and trade of slaves in the history of this insidious industry. It is simultaneously uplifting and saddening to view, but an absolute must do. 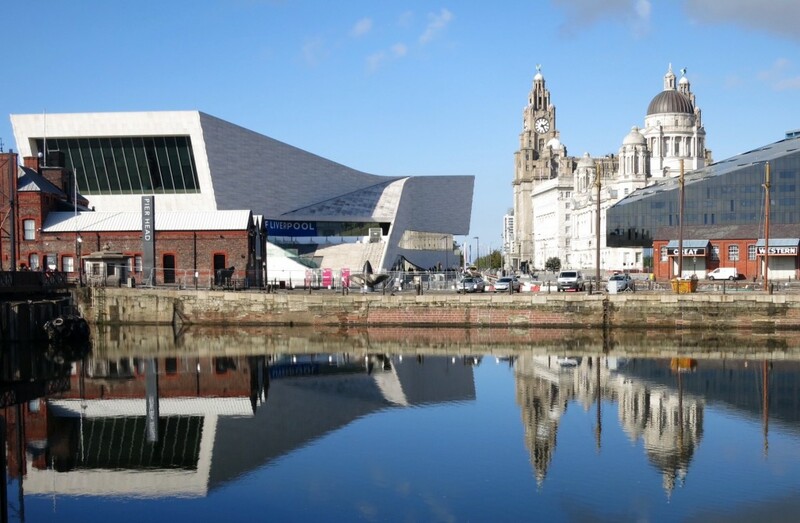 The Museum of Liverpool is an ultra-modern building, wedged between the refurbished original red brick dockside warehouses. 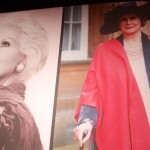 It details the story of the rise, fall and rise again of Liverpool and includes exhibitions about the Beatles and April Ashley. All are well worth seeing. 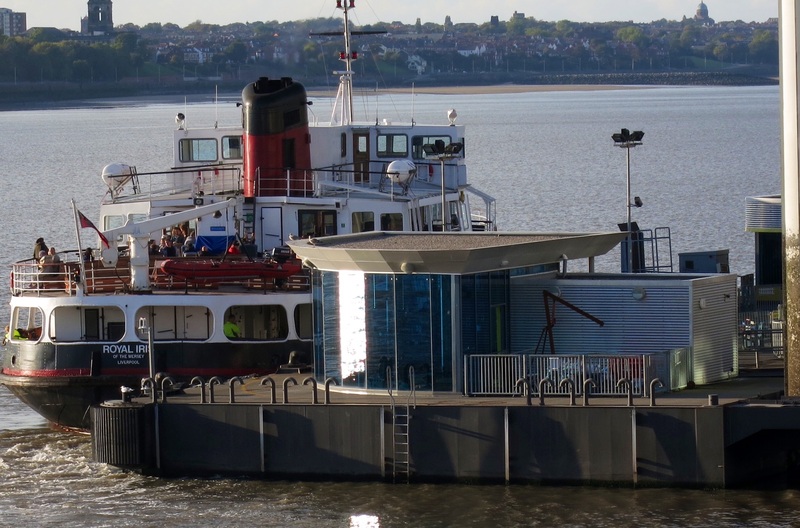 A visit to Liverpool would not be complete without a ferry ride on the Mersey. 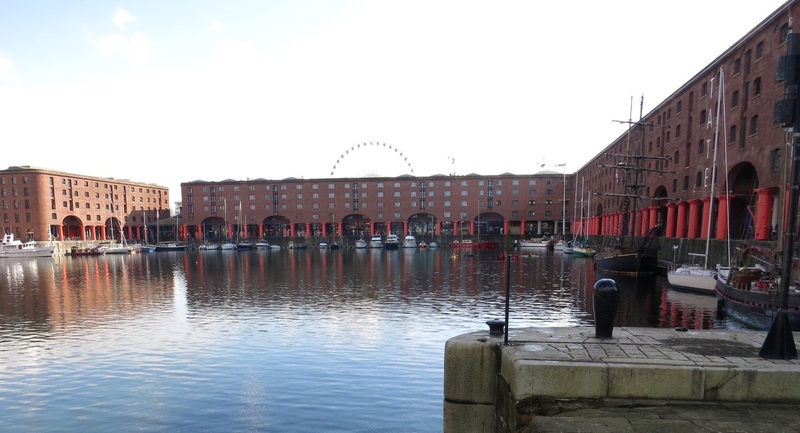 We took the 4pm ferry that leaves every hour for a forty minute ride around the former dock areas of Liverpool. We heard about the importance of Liverpool to the success of Britain and saw new Brighton Beach which is slowly regaining its former popularity. 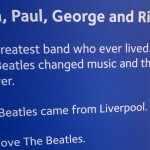 And yes, we heard the famous song played, both leaving and arriving back to the Liverpool dockside. Very atmospheric! 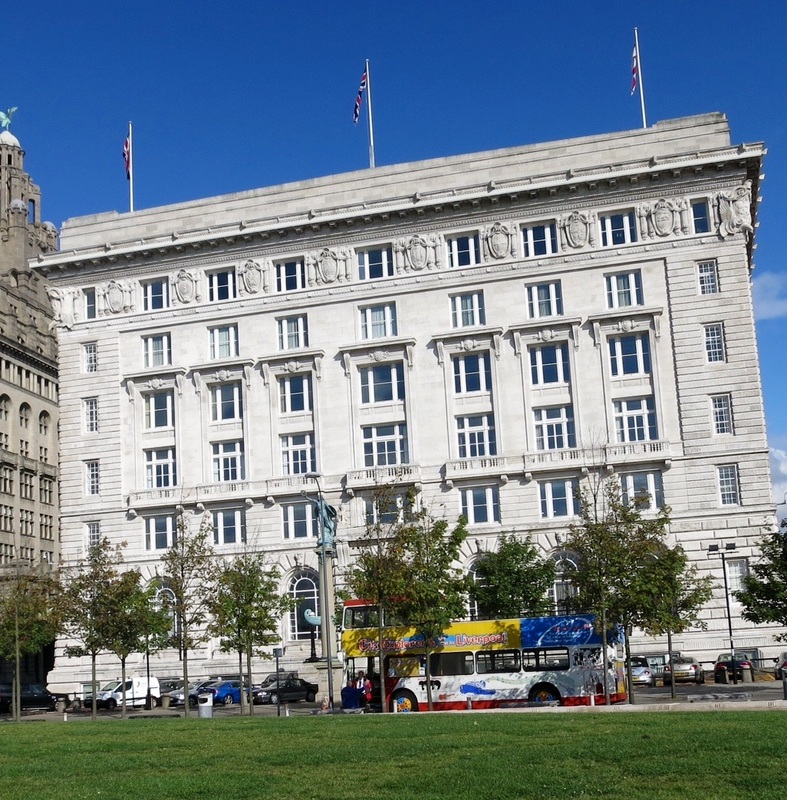 The Cunard Building has strong links to Liverpool’s famous maritime history. Old warehouses now house modern museums and entertainment precincts. 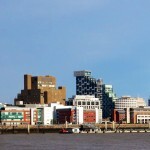 The Liverpool skyline is a strong example of how the new contrasts with the old in this city. 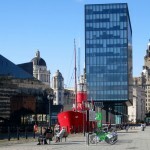 Liverpool is a city with a long and rich history but it is also full of unexpected modern architecture. A wander through the pedestrian shopping malls of District One will surprise many who may be expecting more reclaimed industrial brick warehouses. The glint of innovatively designed steel and glass structures housing modern, chic fashion boutiques and eating houses was quite astounding. Of course, we had to take advantage of this opportunity to find that something special in this retail paradise. Take time out on your UK holiday to see this fantastic northern city.  You won’t be disappointed, particularly if you plan your visit to the gay quarter around the weekend. Looks as if we will need to schedule another visit, very soon.